Kent Women’s Captain Tammy Beaumont has been named as one of Wisden’s Five Cricketers of the Year for 2019. Beaumont finished the 2018 season as one of three names shortlisted for the NatWest England Women’s Player of the Summer, capping off an impressive home season for the Dover-born batter. April 2018 saw the 28-year-old become the fourth Kent player to receive 50 ODI caps for England, following in the footsteps of Charlotte Edwards, Lydia Greenway and current Kent teammate Laura Marsh. The Kent Women Captain excelled as a key part of the England Women ODI squad, averaging 50.22 with the bat in nine ODIs in 2018. Successive centuries against South Africa, firstly at Hove (101) and then at her home ground at The Spitfire Ground, St. Lawrence (105), triggered a run of form where Beaumont did not score less than 40 runs in an ODI for the rest of the calendar year. 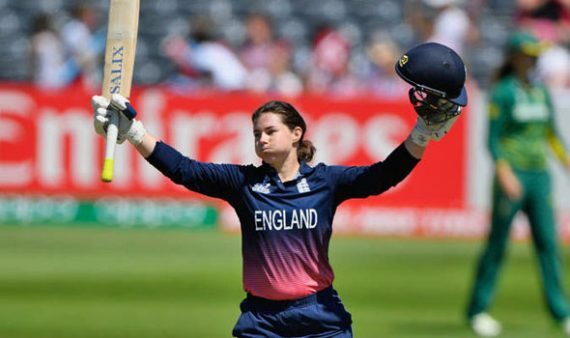 Another impressive performance for England in T20I competition saw Beaumont record her highest career T20I total on 20th June 2018, again versus South Africa, scoring a mammoth 116 from just 52 balls at a strike rate of over 223.00. In that fixture, England recorded the highest ever innings total in a women’s T20 international. At the end of her strong Summer for England, the right-hander was named England Women’s Most Valuable Player after two Summer series against South Africa and New Zealand. In October 2018, she was named in England’s squad for the 2018 ICC Women’s World Twenty20 tournament in the West Indies alongside Kent teammate Tash Farrant and Kent’s new signing, Fran Wilson. Ahead of the tournament, Tammy was also named as one of the players to watch. England narrowly lost out to rivals Australia in the Final, with Beaumont being England’s fourth highest run scorer in the tournament. 2019 sees Beaumont and England contest the Women’s Ashes. The Kent Academy graduate will no doubt be an integral part of the squad for England again this year. This entry was posted	on Wednesday, April 10th, 2019 at 10:15 am	and is filed under Cricket, Featured. You can follow any responses to this entry through the RSS 2.0 feed. Both comments and pings are currently closed.